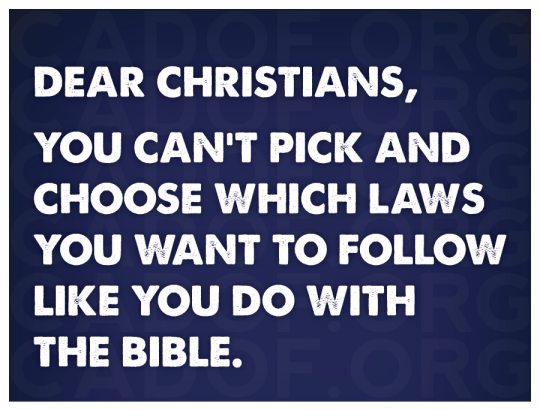 Relevant to Kim Davis’s situation. 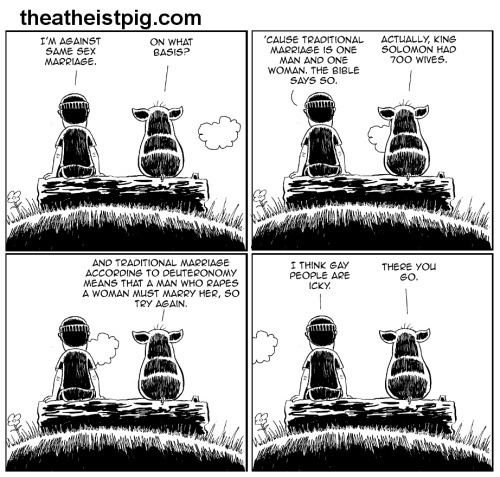 I would wager that this is the real reason most people who oppose gay marriage actually oppose it. Dear Christians who find Harold Camping crazy, you’re not that different if you think Jesus is still coming back, but at an unknown time. – Tweeted by Hemant Mehta of The Friendly Atheist. Retweeted and posted here due to the plain truth if it. Orac, of Respectful Insolence, has a post about how global warming wasn’t "invented" by Al Gore, contrary to what many global warming deniers seem to think. However, the part I find especially interesting in his piece is his explanation of why denialists tend to attack people. If there’s one characteristic of denialists of all stripes, it’s that they have a strong tendency to personalize their dislike of their particular bete noir science. The reason, of course, is that cranks can’t attack the science using good science and, of course, it’s far easier to attack a person than well-supported science. After all, all people have flaws that can be ridiculed or used as the basis of ad hominem attacks. Like Orac, I’ve seen this from global warming deniers, anti-vaxxers, religious fundamentalists, and anti-evolution creationists. Whatever motivates them in their denial, it seems they share this common tactic of attacking the messenger. The advance of scientific research, particularly in the last few centuries, has raised many questions about the interpretation of the Genesis accounts of creation. In attempting to reconcile the Bible and the theories and conclusions of contemporary scientists, it should be remembered that the creation accounts do not give precise details as to how God went about His creative activity. Nor do these accounts provide us with complete chronologies that enable us to date with precision the time of the various stages of creation. Similarly, the findings of science are constantly expanding; the accepted theories of one generation are often revised in the next. As a result, equally devout Christian believers have formed very different opinions about the age of the earth, the age of humankind, and the ways in which God went about the creative processes. Given the limited information available in Scripture, it does not seem wise to be overly dogmatic about any particular creation theory. I just got the latest Answers In Genesis newsletter today. I’m on the list because I ordered some of their videos on their site (one of which I reviewed here). This is the first one I’ve received and I can tell it’s going to be a monthly source of amusement and bewilderment. The lead story in this month’s newsletter is titled “The Emotional Age Issue.” The gist of Ham’s point is that secular folks who obviously don’t have a scientific leg to stand on when it comes to the age of the Earth, get all angry and emotional about the issue when the AiG folks “prove” that the Earth is only about 6,000 years old. I kid you not. There are some wonderful quotes in here that I’d like to share with you (with comments, of course!). Ken says that, in his years of ministry, he’s found that the age of the Earth and the universe is an “extremely emotional topic for secularists.” For biblical creationists, of course, it’s issue that should lead Christians to a “real zeal for the authority and accuracy of the Word of God.” It’s an amazing twist… and one that Ham and other creationists make on a constant basis… trying to make scientific data into an emotional issue while portraying biblical mythology as scientific fact. Get out of jail free… almost. The Onion has a great satire piece that hits the bullseye when it comes to Christian dogma. I’ve written before about how Christianity gives a free pass to sin, but The Onion, as usual, puts its satirical wit to good use and hammers the message home. The first few months behind bars were the worst of my life. Every night I’d stare into the darkness, waiting for the nightmares, waiting to hear those horrible screams all over again. Even here behind these thick penitentiary walls, there was no hiding from what I’d done to that poor family. Then, one night, it happened: I lay alone in my cell, my only companion the visions of wickedness that filled my head. Suddenly, there was a light, and somehow the light spoke to me. It was the voice of Jesus Christ. He told me he had died for the sins of mankind and all could find peace through his salvation. Was I ready to repent? Uh, let me think about that for a sec. Yup! It was a stroke of unbelievable luck. Here I thought I’d spend the rest of my life agonizing over that night I broke into a random house and methodically tortured all five of its residents, but Jesus was like, “Nah, you’re good.” He took all those years I expected to wallow in suffocating guilt for having forced a mother to choose the order in which I strangled her children and wiped them away in a jiff. Which is ironic because the family I murdered in cold blood was praying to Jesus like crazy the whole time. The most disturbing thing about this video is that, even though it’s made by The Thinking Atheist, I can imagine it being shown in a church to the approval of the congregation. Answers in Genesis, the ministry organization founded by Ken Ham, is fairly well known for its apologetics outreach programs such as the Creation Museum, which Craig and I have already reviewed in detail. AiG also produces a large number of audio, video, and print materials to promote their biblical literalist view of the world. I recently purchased some of their downloadable videos and Craig and I are going to watch them as time permits. Not having the patience to wait for a joint viewing, however, I went ahead and watched Four Power Questions to Ask an Evolutionist, a talk given by Mike Riddle, a somewhat prolific contributor to the AiG collection of misinformation. 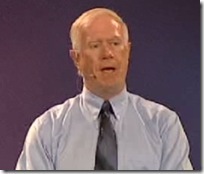 Riddle starts by explaining that apologetics is not only knowing how to answer questions, but also knowing how to ask the right questions and how to take the discussion “back to the power of the Gospel of Jesus Christ where it should be.” His topic for this talk, of course, is what questions to ask an evolutionist. Now, the AiG folks have always had a problem when it comes to understanding the theory of evolution and Riddle is no exception. Of those five topics, only two have anything to do with evolution. The “bible” item obviously has nothing to do with evolution, but Riddle, like many of his AiG colleagues, doesn’t seem to understand that evolution also has nothing to do with the origin of the universe or the origin of life. It only deals with how life developed after it appeared… much like the Big Bang Theory only deals with the development of the universe after it existed (Riddle doesn’t understand that, either, by the way). So right from the start, Riddle shows that he doesn’t even have a basic understanding of the topic on which he is talking. Interestingly enough, that’s a pretty good foreshadowing of what is to come in this talk. I don’t want to quote everything he says in his talk, but I’ll quote some of it. A common tactic Riddle uses (as well as most other creationists and deniers of other stripes) is to cherry pick quotes, use them out of context, and hold them up as evidence backing up his position. Let me summarize my views on what modern evolutionary biology tells us loud and clear — and these are basically Darwin’s views. There are no gods, no purposes, and no goal-directed forces of any kind. Riddle presents this quote saying, “Here’s where we send our children to be educated and this is what they’re taught,” implying that this is part of the classroom curriculum. However, the quote in question was made during a debate about whether Darwinism is a science or a natural philsophy between Provine and Phillip Johnson in 1994. He naturally goes into far more detail about each point, pronouncing each item as undeniably true, including that the six days of creation were a six literal days, even showing a “partial list” of (nineteen) scientists who believe that the creation days were six literal days. His points are somewhat absurd in that they say nothing specific or useful. In explaining that we know how “all things” were created, he points to bible verses that state “God said” and “word of God” and concludes, “so the bible clearly tells us how God created and it is not open to anybody’s opinion.” That’s hardly specific or useful. In his argument that the creation days were six literal days, he uses a weak example of the Ten Commandments being simple to understand in plain language (“Thou shalt not steal… Thou shalt not murder”) meaning that the rest of the bible is simple to understand in plain language, too. So when the bible says “six days,” it means six literal days. This is important because, as emphasized repeatedly by AiG speakers, if you don’t believe Genesis is real, then the rest of the bible falls apart. After going over his six points, Riddle then authoritatively claims that “we have a firm, rock solid foundation. We have answers.” I don’t know if I even have the words to describe how absurd his claim is. How do a few quips from the bible create a “firm, rock solid foundation?” They don’t, and since they don’t, the rest of his talk is made even more absurd, knowing that his initial premise is completely flawed. After laying his “foundation,” Riddle gets on with the heart of his topic, making claims about “evolutionists” that really show off his ignorance of the topic… to the point of being bizarre. He starts by asking what evolution is and then makes this claim (sic). You know the sad thing about this is? I can go out and ask ten different evolutionists to give me a definition of evolution. I’ll get ten different answers. Isn’t that sad? No wonder our children are in such confusion. There’s no set standard or definition of evolution. There’s no set standard or definition of evolution? That will come as a complete shock to thousands of biologists, paleontologists, geneticists, and anthropologists. Not that Riddle’s rhetorical coffin needed any more nails in it, but that statement would certainly qualify as the “final nail.” However, not to be deterred by reality, Riddle confidently strides on, explaining what evolution really is, since no “evolutionists” seem to know (sic). Evolution is based on something called materialism. That is the ideology that all that exists in this universe is mass and energy. It is the ideology that there is no creator god. Folks if there is no creator god, there is no Jesus Christ which the bible clearly teaches Jesus Christ was the creator. In other words, if evolution therefore is true, then the bible has to be wrong or if the bible is true, then evolution has to be wrong. I just want to point out that he didn’t define evolution even a little bit. Again, however, Riddle is not deterred by his shortcomings. Reiterating that he already has a foundation and has answers (from the bible), he asks if evolutionists have a foundation. I don’t want to spoil the ending, but he concludes they don’t… as he finally gets into his “power questions,” the first of which has to do with the origin of the universe, something about which evolution says absolutely nothing. Actually, Riddle spends the vast majority of his talk arguing about things irrelevant to evolution. His first question, after giving a mocking explanation of the big bang, is “Where did the matter come from to create the big bang?” After a few more mocking comments about supposed answers he gets to this question, he states that this is a perfectly legitimate scientific question. Shockingly, I agree with him. It is a perfectly legitimate scientific question… one that cannot be answered by a simple, dismissive “God did it” response… and one that has absolutely nothing to do with evolution. The universe burst into something from absolute nothing – zero, nada. And as it got bigger, it became filled with even more stuff that came from absolutely nowhere. The main problem with this quote is that it appears nowhere in the Discover Magazine article. It appeared on the cover of the magazine, but not as a quote from Guth. If Riddle would have actually read the article, he would have gotten the actual explanations, but that wouldn’t have suited his purpose, which seems to be mocking science and misleading his audience. He further displays his ignorance about the science, offering more cherry-picked, out-of-context quotes and pretending to understand quantum physics. Of course, he claims, the counter-question will be “Who created God?” He has an answer, of course, and quotes a couple bible verses. I am Alpha and Omega, the beginning and the end, the first and the last. In other words, the bible teaches very clearly god is a self eternal being and has no beginning no end. He says that the reason he uses the bible is that it’s “the most powerful tool we have.” I’ll leave the snarky response to that statement to my readers. Riddle continues on for quite a while about the question of the origin of the universe, but I want to move on… but only after saying that I always find it interesting when creationists like Riddle ridicule science on one hand, but want to use science to support their creationist claims on the other hand. The same science they mock is okay with them if they can use it to back up their claims (which is a common denialist trait in general). That’s a good question. It has nothing to do with the theory of Evolution, but it’s a good question. However, Riddle clearly doesn’t understand even the question, much less the answers, because he immediately sets up not only a false dichotomy, but an invalid false dichotomy (is there such a thing?). He says there are only two possible options for the origin of life. Point one has to do with evolution, which can only happen after life originated! Since I’ve come this far, however, I’ll give him the benefit of the doubt and assume he really meant “Life originated by natural processes.” Then, at least, it’s a valid false dichotomy. The “model of evolution” teaches that about 4.5 billion years ago, the Earth formed all by naturalistic processes. This is their foundation for how life got started. Then, over long periods of time, chemicals began to form in a pool where they nicknamed the primordial soup. Then, over more long periods of time, these chemicals bonded together to make molecules, and finally, over more long periods of time, these molecules bonded together to make the first living cell and we have our formula “time plus chance equals life.” Does that make you feel pretty good about yourself? Something exploded, formed a pool of chemicals, and here you are. That gives you some self worth there. That almost makes my head explode. What he has mockingly described is “abiogenesis,” the hypothesis that life originated by chance from inanimate matter (except for the “and here you are” part, which could factor in evolution). What is even more telling about this quote, however, are the statements about feeling good and giving self worth… as if having a healthy sense of self worth has any bearing on the validity of scientific facts. 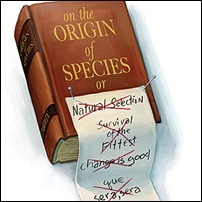 It’s an argument that I do hear from creationists regarding evolution… that evolution makes life pointless and makes humans “just another animal.” They seem to think that science is invalidated if it makes claims they don’t like (again, another classic denialist trait). 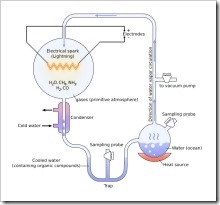 The Miller-Urey Experiment was groundbreaking, but that was 57 years ago and scientific knowledge has progressed a long way since then, so using it as a refutation of abiogenesis seems disingenuous at best. Riddle tries to make the experiment sound very dramatic and adds how horrible it is that students are then taught that we don’t need a creator because we can do it ourselves. It’s a long part of the talk and it’s essentially pointless, but he goes there anyway. If you rule the truth out, if you cannot accept the truth, you have to accept anything in its place and that is what evolution is. What we are observing today out of our universities and high schools is our students are coming out of those schools repeating the same mistakes we did 30 years ago because we’re unwilling to teach all the scientific evidence. The irony, of course, is that the same statement would apply to Christian apologetics, but instead of a thirty year time span, it would be a 2,000 year time span because of an unwillingness to teach any of the scientific evidence. Creationists like Riddle are making every attempt to move science and our corresponding understanding of our world back to the bronze age. At this point, the fifty minute video is thirty-six minutes complete. That means that the final twelve minutes will be used for the final two power questions. Amusingly, the final two questions are the only questions that actually address evolution. The lead up to power question number three is tedious and reiterates many of the fallacies that Riddle has already perpetrated earlier in the talk. Basically, it’s “Where are the transitional fossils?” Predictably, his objection to the fossil record is based on the “Cambrian Explosion.” This is such a tired, old creationist clichÃ© that it’s tiresome just to think about addressing it yet again. Riddle displays not only ignorance of the fossil record, but ignorance of the Cambrian and Pre-Cambrian periods. To get the facts, go here and here as starting points. Both links provide plenty of references and follow-up links. Perhaps email some of them to Riddle. I need to see the observable evidence. Why? Because great claims require real evidence. 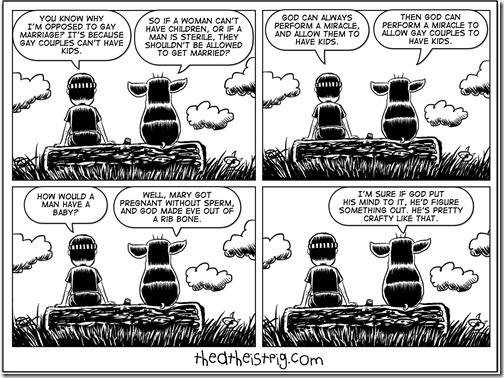 Biblical claims, of course, need no such scrutiny in his mind. I really want to say that his statements are born of ignorance, but Riddle (and many of his creationist colleagues) seem to maintain a willful ignorance that really approaches stupidity or unassailable stubbornness to accept reality. Riddle claims to have gone through Ernst Mayr’s entire book, What Evolution Is, and offers up another great cherry-picked quote. Given the fact of evolution, one would expect the fossils to document a gradual steady change from ancestral forms to the descendants. But this is not what the paleontologist finds. Instead, he or she finds gaps in just about every phyletic series. After the above quote from Mayr’s book, the text goes on to explain why fossils are, indeed, rare and says that some fossil lines are incredibly complete. The facing page of the book shows about sixteen transitional fossils leading from reptiles to early mammals. Riddle’s summarization of Mayr’s book is not only misleading, but is a bald-faced lie. Why are these transitions not in the museum? How about a thought here? Just a thought. They never existed. If those transitions were readily available, I believe they would be in the museum, but we don’t see them. I’m going to go out on a limb here and guess that Riddle has never actually read a book about paleontology… or evolution… because if he had, he would have seen plenty of smaller forms all leading up to the larger forms of the dinosaurs. He again makes the statement that “Great claims require real evidence” and follows it up with more cherry picked, out of context quotes from dinosaur books. Riddle seems to pile more and more ignorance-born absurdities on top of his “rock solid” biblical foundation. He says, of course, that dinosaurs were created on day six according to Genesis. His conclusion is always that he has a reasonable and rational faith… a logical faith, not a blind faith. He says that, since evolution can’t be defended scientifically, it must be a faith-based belief system with no foundation. How anyone who claims to understand evolution can say that with a straight face is almost unfathomable to me. Willful ignorance? Outright deceit? Simple stupidity? I don’t know, but the hypocrisy and misinformation that overloads Riddle’s talk is outrageous and inexcusable. The sad part is that the audiences that hear Riddle’s talk will walk away thinking that the nonsense that he spewed so authoritatively is somehow true. They’ll continue to not understand what the theory of evolution states, continue to think there is no fossil evidence, continue to be ignorant of other biological evidence for evolution, and generally feel that Riddle’s presentation was sensible, logical, factual, and genuine. Talks like Riddle’s spread ignorance like the plague and Answers in Genesis helps carry that plague all over the world. It’s harmful. It’s contemptible. It’s deceitful. Trying to wrap my head around creationist astronomy is like trying to ride a unicycle around a Moebius strip: itâ€™s off-balance, physically impossible, full of one-sided arguments, and in the end you donâ€™t go anywhere.